Intisari Utama Sdn. Bhd. - 10,000,000 (1.15%). 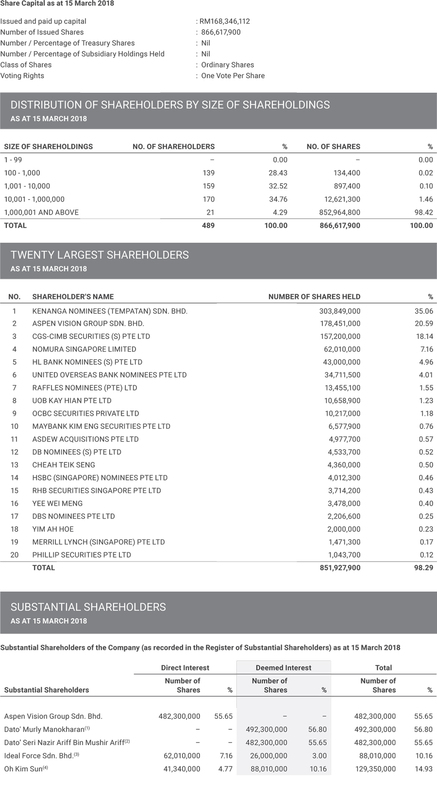 Dato' Murly Manokharan holds 63% and 100% of the ordinary shares of Aspen Vision Group Sdn. Bhd. and Intisari Utama Sdn. Bhd. respectively. 303,849,000 ordinary shares in the Company held by Aspen Vision Group Sdn. Bhd. are pledged to Kenanga Investment Bank Berhad. By virtue of Section 4 of the Securities and Futures Act, Chapter 289 of Singapore, Dato' Seri Nazir Ariff Bin Mushir Ariff is deemed interested in the shares of the Company held through Aspen Vision Group Sdn. Bhd.as he holds 20% of the ordinary shares of Aspen Vision Group Sdn. Bhd. By virtue of Section 4 of the Securities and Futures Act, Chapter 289 of Singapore, Ideal Force Sdn. Bhd. is deemed interested in shares of the Company held through Setia Batu Kawan Sdn. Bhd. Ideal Force Sdn. Bhd. holds 30% of the issued share capital of Setia Batu Kawan Sdn. Bhd. Setia Batu Kawan Sdn. Bhd. - 26,000,000 (3%). The issued share capital of Ideal Force Sdn. Bhd. is wholly owned by Mr. Oh Kim Sun and his associates. Mr. Oh Kim Sun holds 20% of the issued share capital of Setia Batu Kawan Sdn. Bhd. Based on the information available to the Company as at 15 March 2018, approximately 27.67% of the total issued ordinary shares of the Company is held by the public and therefore, Rule 723 of the Singapore Exchange Securities Trading Limited Listing Manual Section B: Rules of Catalist is complied with.